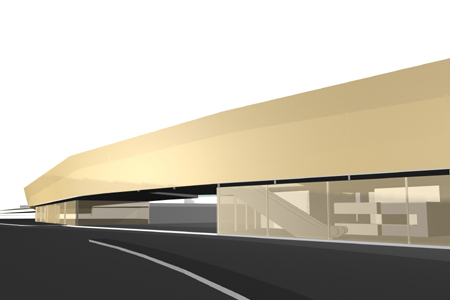 In order to satisfy the functional as well as the urban planning requirements, a building was created with a split-level parking-deck with a multifunctional level above it containing various service facilities while at the same time providing the base of the grandstand. The interplay between conscious structural elements and see-through views creates a definition of the exterior space. 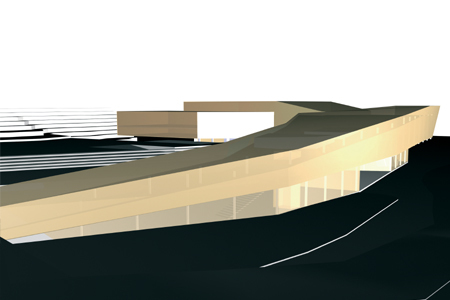 This concept makes possible multiple viewing axes towards the slope that dominates the finish line. The slope is visually extended to Coburgstrasse by the slanting parking deck and the connecting ramp finger that offers skiers arriving at the finish line access to the gondola at the entrance level.